What a breath of fresh air! Another day with weather uncooperative for running so it was definitely a sign to stay indoors and attack some core work. As you know, I love core work, but I love having lots of variety and staying away from the same ol’ same ol’ that can be found with endless crunches, etc. 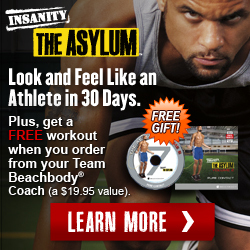 There is not a ONE in this Asylum volume 2 workout! You will not spend one minute lying on your back, are rarely will you get to sit down. YES! For this workout you need a surprising amount of equipment – yoga mat, jumprope, medium weight dumbbells, a few lightweight dumbbells, strength bands, and optionally a pull-up bar. For this first go-around, I opted to not use the pull-up bar, but I can see how tremendous it will be when added! The workout was plenty the way I did it, so don’t hesitate to ease into it – your copy of Asylum Volume 2 isn’t going anywhere! 1. Which volume do you prefer? This is a tough question! I am approaching them very differently so it is difficult to say. I also have a few more workouts to preview before putting it together and going for some REAL RESULTS. I definitely think they will go together as a whole very beautifully and that I absolutely recommend that everyone tackle Asylum Volume 1 before taking on Asylum Volume 2. 2. Can I modify for my abilities? Yes! Absolutely! As crazy as these workouts are, they can be modified for a lot of levels. In the videos you will see several different levels of modifying going on as examples for you. Also, if you can only do a few seconds of each exercise to start, then just do that! Just keep going and you will improve. You are doing more than everyone else that is doing nothing! 3. I’m super sore. What should I do? Definitely feel free to throw in an extra stretch day. Get friendly with your foam roller and learn some self myofascial release. Take an epsom salt bath. Get a massage. Do some sort of lighter movement. Drink lots of water. Eat well. Asylum Volume 2 is a bear, but make the schedule work for YOUR body – don’t get married to the schedule. Oh, boy! November was probably the busiest month I have ever had and as a result, it took me until now to get to this workout. I did plenty of running, just no Shaun T. Let me tell you what – taking time away like this has me paying today! This is an incredibly fun workout, but also killer on the legs. Power Legs is NO JOKE! Shaun T declares at one point in this video that he is going to “kill you today”; he is true to his word! For this workout you need your ladder, a heavier dumbbell, and bands. There are plenty of plyo moves, but also some agility ladder work, slower focused work (beware of the final Burn Out! ), and all sorts of fun with the bands. Just like all the people in the video, you will be pushing to your max. I definitely suggest starting with a lighter band (yellow or green) and not red like I did. My yellow and green bands have all broken so I thought I’d give it a try. It was doable, but not the smartest way to start. If you’d like to take a peek at some of the moves, scroll down to my review video and leave a review if you like! I have had some GREAT questions about Asylum Volume 2. Here are some new ones I’ve gotten recently. Please keep sending them my way. 1. Do I need to do Asylum 1 first? I think it helps because Shaun T builds upon what happened in Volume 1, but it isn’t 100% necessary. However, the currently available version of Asylum Volume 2 does not include the agility ladder or speedrope. (You can provide your own or click the links in the previous sentence to buy them separately.) Another reason to have Asylum 1 is to do the hybrid at the end. Can you imagine 8 weeks of Asylum Volume 1 AND Asylum Volume 2 together? YAHH! 2. Is this good to do as a hybrid? YES! I think these workouts are excellent as planned in the Asylum 2 program, but I also think they are great used in conjunction with other programs or other types of workouts. Get creative with your hybrid planning, always looking first at what your goals are. 3. Can I just do these workouts sometimes? This goes along with number two. If you use these along with other types of training, I think it can be an excellent blend. Adding these to my ultrarunning would be really smart, stimulating more work in all energy systems. These would be great to add in with football, soccer, tennis, etc. Take a look at the Agility Tutorial and X Trainer, both of which were very focused on the agility ladder. Give it a shot! Shaun T meant it when he said he was taking it up a notch! 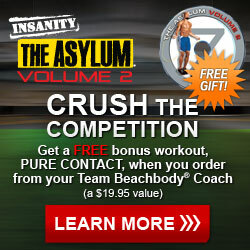 We all asked for more weights work from Shaun – Insanity had none, Asylum Volume 1 had some, but Insanity the Asylum Volume 2 has it GOING ON! This is just the third workout in the series that I have reviewed, but he has gone bananas with the upper body work and included plenty of weights in Upper Elite. I am an ultrarunner. I don’t spend much time with upper body weights – I don’t want to carry a lot of weight on top. In doing today’s workout I decided to use lighter weights, copying what the girls in the video were using. It was plenty for me, especially the first time through so I could learn the workout and the pacing. It is a full hour long and has just a few breaks – get ready to go when you put this one in! Upper Elite focuses on biceps, triceps, deltoids (all three areas), pecs, abs (all areas), and he throws in some agility work in the ladder just for fun. That is my favorite part! I have had some GREAT questions about Asylum Volume 2. Please keep sending them my way. 1. Do I need to do Asylum 1 first? I think it helps because Shaun T builds upon what happened in Volume 1, but it isn’t 100% necessary. However, the currently available version of Asylum Volume 2 does not include the agility ladder or speedrope. (You can provide your own or click the links in the last sentence to buy them separately.) Another reason to have Asylum 1 is to do the hybrid at the end. Can you imagine 8 weeks of Asylum Volume 1 AND Asylum Volume 2 together? YAHH! 2. It looks way too hard, forget it. OK, it isn’t easy and it isn’t for beginners, but it isn’t as crazy as it looks. Until this review, the only videos you may have seen me do are the Agility Tutorial and X Trainer, both of which were very focused on the agility ladder. I am a trail runner so this comes easily to me. My trails are rocky, rooty, mountain trails so running for me is basically constant 3-D agility ladder work with forward momentum. I am not an expert, and the sequences are taught in a really straightforward fashion. Give it a shot! 3. How much space do I need to do Asylum Volume 2? Ideally about 10′x15′ if you want to set everything up and not shuffle things around. Otherwise, just enough room to set up your agility ladder and have space to work on all sides of it. The ladder is about the same length as the plyo pad, or a yoga mat. Also, you will want to have enough height to use the speed rope. In a pinch, move furniture around a bit to add a little extra space. Here we go, the first full workout in The Asylum Volume 2! I am SO HAPPY I took the time to do the Agility Tutorial yesterday because it paid off big time today! I know it is so tempting to skip tutorials, especially if you have been doing other difficult workouts, but this one is a MUST DO! It saved me so much time and frustration. X Trainer is a 50 minute workout that is similar in design to Speed & Agility from The Asylum Volume 1. The main difference is that X Trainer has much more complex footwork patterns in the ladder. There are fun and challenging new variations to the rest of the work that help keep things fresh and interesting, pushing you to grow with new challenges. There are lots of crazy new pushup sequences that will challenge the best, and can be modified for all levels. Shaun T’s Athletic Matrix came into full effect with this workout! This is his pro-athlete training model that uses dynamic multi-directional movements to activate multiple muscle groups at the same time. This is a super efficient way to work out that has so many levels to challenge yourself with. The Asylum Volume 2 is delivering on its promise to take you to the next level!